Missouri auto dealers will soon face several new requirements they must comply with in order to operate legally. As of August 28, 2018, the amount of the Missouri auto dealer bond will increase from $25,000 to $50,000. Prior to that date, licensed and bonded dealers will need to have their bond amount increased. New applicants for a license in the state will just need to obtain the $50,000 bond even if they’re applying before Aug. 28. Here is a list of all the new requirements that dealers will be facing as of August 28! Senate Bill 707 was signed by Missouri governor Mike Parson on July 5, 2018. The Bill introduces several changes to existing sections of the Revised Statutes of Missouri (RSM) that concern auto dealers. These are the main changes introduced to the RSM under Bill 707. The surety bond requirement constitutes the most significant change to current law and will mean higher premiums for dealers. See below for an overview on how your bond cost may change. Apply for a free no-obligations quote on your auto dealer bond! 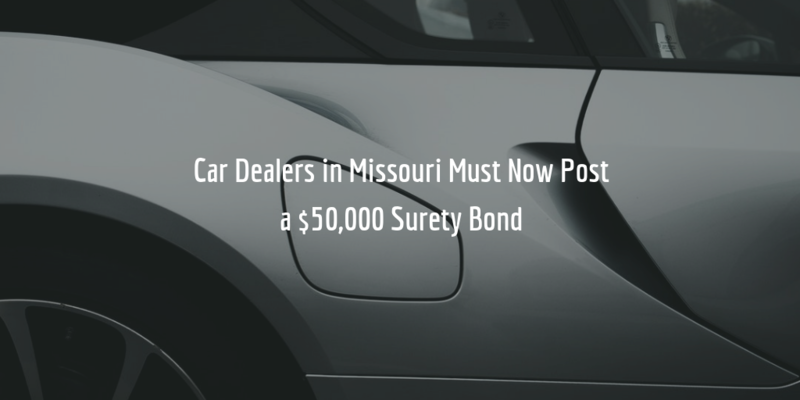 The Missouri auto dealer bond amount will now double. This means that auto dealers will also need to pay a higher cost. Dealers whose personal credit score has not changed much since they last got bonded may expect to have their bond cost also become double. Dealers whose credit score has increased will most likely also see an increase in their bond premium, though this increase will likely not be double. For new applicants, it may be useful to note that surety bond cost is equal to a percentage of the full bond amount. This percentage, or bond rate, is based on applicants’ credit scores as well as, at times, their financial statements, assets, liquidity, personal resume, etc. Your credit score is the most important factor and the higher your credit score – the lower the rate you are offered by the surety will be. Moreover, by working on improving your credit score over time, you are sure to get increasingly better rates when you apply to renew your bond. To get an estimate of the cost of your bond, you can try our bond cost calculator below. If you want a precise and free quote on your bond, just complete our bond form, and we will contact you with your quote shortly! For a FREE exact quote, take 5 minutes to submit our online application and we'll be in touch with you shortly.